Let’s face it. We love diets. We love simple instructions that promise magical results. And you’ll arrive at your perfect weight. Diets are an external solution to an internal problem. Please join me as I coach you today on why we all love diets, and love to search for them and read all about them, but know, inside, that they aren’t the answer to your extra weight. 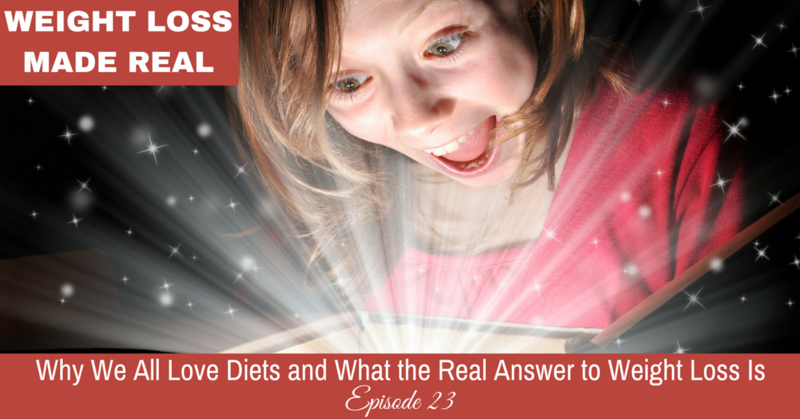 If diets aren’t a solution to losing your extra weight, well then, what does work? Why it doesn’t work to keep trying to change the way you eat. How those diet books with the big recipe sections fool you every time. Why you love those simple 5 step guides to do anything, including weight loss. Is your extra weight the problem? Or the symptom? If you aren’t hungry and want to eat, what should you do? How do you find the right solution to the problem of eating beyond what your body needs? And, how to figure out your own causes of overeating so you can truly treat the problem correctly. Let’s talk about finding the right solution to the problem of your extra weight. And, to do that, let’s learn how you created that problem in the first place. See you in the podcast. This entry was posted on Tuesday, June 7th, 2016 at 4:47 am	and is filed under Podcast. You can follow any responses to this entry through the RSS 2.0 feed. Both comments and pings are currently closed.